… but I haven’t had chance to update this blog in over a week. Dreadful, I know… because this is spring and it is sunny and warm – truly warm… I’ve been gardening all day and I’ve a sunburned nose – so I should be reporting on all the things I’m seeing and hearing. But not a peep from me in over a week. And no interesting photos today, I’m afraid. Finally, the primroses are making a show. Really late this year – in mild autumns we’ve seen them as early as the last week in November. But this year, having been shocked into submission by the sub-zero December and January temperatures, the primroses have bided their time and are only now flexing their leaves and petals. 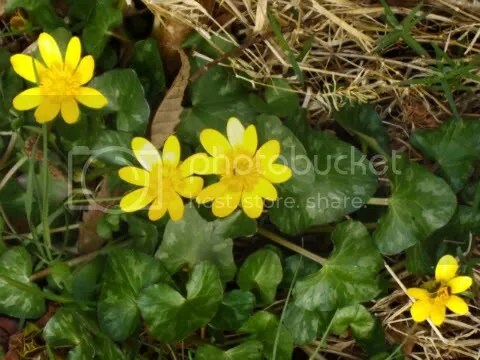 The warmth of the past few days has brought forth the bright yellow celandines – another welcome sight after the grey days of January and February. They are a renowned weed but growing wild in the hedge beneath the big sweet chestnut tree at the bottom of the drive, they do look lovely. Also making their annual appearance are the dandelions. They’re rather shy at the moment… their flowers are hugging the ground and have yet to stand tall and proud… but this may be because as soon as they’re visible, I’m wrenching the plants from the ground and feeding them to Muppette and the mini-Muppettes – famille Lapin. They’re happily forsaking the complete rabbit food and – in a very Country Living sort of way – expressing their preference for locally grown, seasonal produce and chomping as much fresh sweet grass, plantain and dandelion leaves as I can provide. Walking the dog has taken on a whole new, low-level aspect as I stroll up and down the hill, eyes fixed firmly on the grass verges, picking what looks like the choicest specimens of the spring crop. We’ve spent a lot of time in the garden over the past week, removing the exceptional – but not particularly eyeable – bramble crop from last year. I have to say that the harvest of blackberries was welcome though, and we’re still enjoying blackberry and apple crumbles, bramble jelly, blackberry crème brulée, Pavolvas piled high with spiced pears and blackberries… the brambles weren’t pretty but they taste great! We’re now weeding the gravel along the south side of La Fosse. 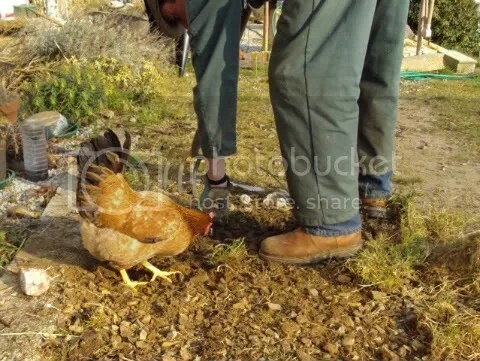 Patrick has been doing the heavy duty weeding… ably assisted by Cèline, our attack chicken. It’s been proposed – after examination of chicken DNA – that they are directly decended from dinosaurs. Even more improbably, they have Tyrannosaurus rex in their ancestry. Except that, if you know Cèline, it’s really not that improbable at all. One look from her beady little eyes has the cats dancing respectfully – and prudently – around her, avoiding her completely given a viable alternative – preferably arial – route. Cèline. T.Rex… yep, I don’t need any convincing. All is quiet down at the pond but the good news is: the tadpoles have hatched. I have taken photos… the quality is abysmal. I’ll try again tomorrow and see if there’s something worth including here. The problem at the moment is they are newly hatched and tiny. Looking at a photo of them clustered together at the bottom of the pond is utterly unremarkable. Which, since these little creatures have emerged from three weeks in a blob of jelly, really doesn’t feel fair – it isn’t doing them justice. I’ll see what I can do. Santé! Cheers! Or – as the French often and surprisingly say – “chin-chin”.